They worry about sharing secure data with a third party. They see news stories, like the website hackings that happened to Formspring earlier this year. All of this makes them cautious — and rightfully so. Legally, business owners are still responsible for making sure data is where it needs to be. They must ensure proper storage of electronic documents, and require user authentication in order to access the information. It is the business’ reputation that is on the line (and in many instances major financial events that are on the line, as well) should something go wrong, so it is crucial to tread carefully when choosing a cloud storage system. Many people outside the IT field fail to realize that cloud computing can actually be safer than hosting files on local systems. Much of the malware and viruses that comb the web today prey on company employees. Users click through to dangerous websites or download infected files. Then, if files are stored on an employee’s computer, it corrupts them. The danger doesn’t stop there. Often viruses and malware can travel through an unsecured network and infect other computers in the office, leaking sensitive data left and right. Cloud computing adds an extra layer of security by backing up data off-site, reducing the need for storing it on local systems and limiting cyber security issues. Even systems with anti-virus software can be hacked. The basics of how these programs work hasn’t changed much, even as other technologies have evolved. Most of them are set up to run regular checks of the system; however there is a loophole in this method. During the check, the software can’t check the space that it, itself, takes up. That sometimes allows things to slip through the cracks. The advantage to cloud storage is that programs designed to ensure their security are often housed off-system, which allows them to do a complete check of where sensitive data is stored — loophole free. Often, once business owners understand the advantages and take into consideration the risks, they find it’s worthwhile to invest in cloud storage. The key is just to use caution when choosing a vendor and ensure that the digital storage system chosen is secure. When maximum security of documentation is required, such as for a merger, acquisition or other financial event, cloud storage in the form of a virtual data room is a reliable solution. In such cases, be sure that your virtual data room is protected by full strength 256-bit encryption, multi-factor authentication, a redundant infrastructure, and 24/7 monitoring, and that the data center is SAS 70 certified. 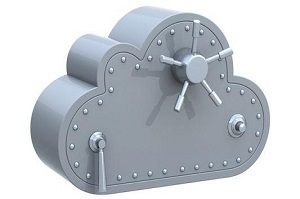 In this way, even the most sensitive of files can be protected securely in the cloud.